As Wu-Tang pointedly noted back in 1994: cash rules everything around us. And this couldn’t be more accurate for small businesses. So if that sucking sound you’re hearing is your cash flow, then please, read on. What we’ve got here are a few simple ways to help avoid a cash deficit right when you need it the most: when the season is in full swing and you’re buying materials for installs or repairs, paying out payroll. Yet, you still haven't received every dime for work you already did this season. Always maintain a reserve of liquid assets (i.e. extractable capital). Even the best of businesses will have financial shortcomings, they happen to everyone. What separates the great businesses from the sub-par is how they overcome, survive and - ultimately - thrive once faced with these challenges. And a cash reserve is exactly what those great businesses lean on when the time comes. This is the number one way to grab cash before you get into the mix. Send out contracts that include your seasonal work and regular maintenance during the winter months. You’ll get the checks before you do the work, instead of grasping for them well after. Either before the work, on-site, or immediately following. If you accept credit cards you’re much more likely to receive payments faster. Granted, you’ll be incurring some service fees (you’ll need to set up a merchant service account for the processing which may have a monthly cost, plus a small percentage on each batch/transaction), but when you need the cash it could well be worth it. It’s also 2018 and the next generation of consumers rarely pay with cold-hard cash. And most don’t use a checkbook. Piggy-backing off the last point, when it comes to cash flow, your Days Outstanding get pretty dang short when you’re accepting payment 5 minutes after completing the work. Just make sure there’s someone home to pay you. 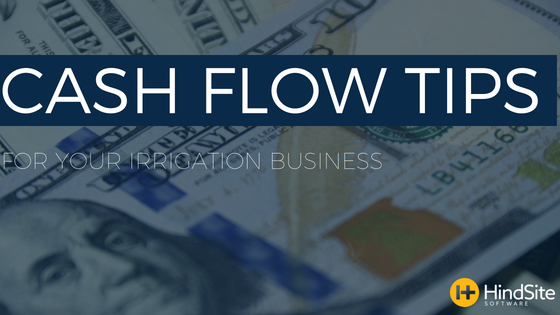 How about just understanding your annual cash flow, so you can plan for it. That means running a couple of reports (check out this blog post on cash flow reports), and actually planning how you’ll spend cash during the “off” months, so when things are gangbusters during the early season you’ll still have the right amount of cash on hand. Your distributors will love you for this. You’ll be able to take advantage of opportunities as they happen. You’ll be able to keep up with Murphy’s Law – repairing equipment, hiring more people, etc. – instead of funding the company with your own paycheck. Because that's never fun.